PROF. M. VISWANATHAN HONOUR AWARD HELD AT TAJ CLUB HOUSE CHENNAI ON 1ST DECEMBER, 2012. Dr.Peter Rossing, Head of Research & Chief Physician, Steno Diabetes Center, Denmark receiving annual Prof. M.Viswanathan Honour Award that contains bust and citation from Dr.V.Kanagasabai, Dean, Madras Medical College and Rajiv Gandhi Government General Hospital, Chennai. Dr.Vijay Viswanathan, Head & Chief Diabetologist (left) and Dr.Narasinghan, Dean(right) are also seen. LAUNCH OF SCHOLARSHIP FOR HIGHER EDUCATION TO UNDERPRIVILEGED CHILDREN AND YOUNG WARRIORS AGAINST DIABETES HELD AT PARZI CLUB AUDITORIUM ON SATURDAY, 24TH OF NOVEMBER, 2012, CHENNAI. Tmt. S. Gokula Indira, Honorable Minister for Tourism, Govt. of TamilNadu Launching Scholarship for Higher Education to Underprivileged Children and Young Warriors Against Diabetes. The minister is flanked by Dr.Vijay Viswanathan, Managing Director (Left) and Ms. Mari Ruddy, Director and Founder TeamWILD, USA (Right). Tmt. S.Gokula Indira, Honorable Minister for Tourism with Type-1 diabetes children. Dr.Vijay Viswanathan, Ms. Mari Ruddy and Mr. Dinakaran of Novo Nordisk are also seen. (Photo right) Dr. Vijay Viswanathan, Managing Director of M.V.Hospital for Diabetes with Type-1 diabetes children and other staff of the hospital. 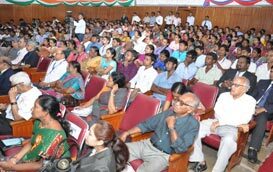 LAUNCH OF 'FILM ON DIABETES' AND 'DIABETES CAREON WHEELS' HELD AT MVH AUDITORIUM ON WEDNESDAY 14TH OF NOVEMBER,2012. Mr. Arun Anant, Chief Executive Officer, the Hindu launching the DVD of 60 seconds video film on 'Diabetes'. Dr.Vijay Viswanathan, Head, Chief Diabetologist, M.V.Hospital for Diabetes and Actor Mr.Vijay Adhiraj are also seen. HUMAN CHAIN FORMATION BY MVH STAFF AT THE HOSPITAL CAMPUS IN ROYAPURAM AND WALK BY INDIAN COAST GUARD AND MVH STAFF BESIDES BLUE LIGHTING NAPIER BRIDGE IN CONNECTION WITH WORLDDIABETES DAY FUNCTION HELD ON WEDNESDAY 14TH OF NOVEMBER,2012. World Diabetes Day walk by Indian Coast Guard and M.V.Hospital for Diabetes, Royapuram. The walk is led in the front row by Inspector General S.P.Sharma, TM, PTM, Commander, Coast Guard Region (East) and Dr.Vijay Viswanathan, Head, Chief Diabetologist, M.V.Hospital for Diabetes (Dy. Inspector General Gurupdesh Singh, TM, Chief of Staff, Coast Guard Region (East) and Dy. Inspector General B.K.Loshali, Chief Staff Officer (P & A), CGR (East) are also seen. CHENNAI ON TUESDAY 25TH OF SEPTEMBER, 2012. DIABETES AWARENESS AND SCREENING CAMP FOR INDIAN COAST GUARD (EAST) HELD AT CHENNAI ON 25-09-2012. Mr. S.C. Tyagi, Dy. Inspector General of Police, Indian Coast Guard (East) presenting a bouquet and memento to Dr.Vijay Viswanathan , Head & Chief Diabetologist, M.V.Hospital for Diabetes, Royapuram Dr.Pradeep Shankar, Regional Medical Officer, Indian Coast Guard (East) is also seen in the picture. Photo above diabetes screening camp is in progress. CHENNAI ON TUESDAY 28TH OF AUGUST, 2012. DIABETES SCREENING AND AWARENESS CAMP FOR MADRAS BAR ASSOCIATION HELD AT MADRA HIGH COURT CHENNAI ON 28-08-2012. Dr.Vijay Viswanathan addressing Madras Bar Association and Photo (Right) Hon'ble Justice Mr.Venkataram felicitating Dr. Vijay Viswanathan, Managing Director M.V.Hospital for Diabetes, Royapuram. Mr.Y.Gee Mahendran, noted dramatist (3rd from left), Mr.Vijay Athiraj, noted TV actor and anchor (2nd from right) Mrs.Rashna Adhiraj (extreme right), Dr.Vijay Viswanathan, Managing Director, M.V.Hospital for Diabetes (2nd from left), Dr.Neeraj Bedi, Medical Superintendent (extreme left) are seen on the dais. Photo (right) Dr.A.Syed Abhuthahir being received a memento from Actor Mr.Vijay Athiraj for best service. Images of Mr.Y.Gee Mahendran from his drama "Natakam " are seen below. CHENNAI ON FRIDAY 10TH OF AUGUST, 2012. A PANEL DISCUSSION ON DUAL BURDEN OF DIABETES MELLITUS AND TUBERCULOSIS – FACTS & CHALLENGES HELD AT MARIE GOLD, GRT CONVENTION CENTRE, CHENNAI ON FRIDAY 10TH OF AUGUST, 2012. 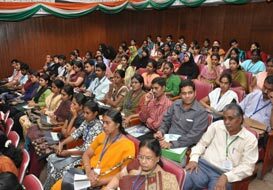 Dr. Soumya Swaminathan, Scientist-G, National Institute for Research in Tuberculosis, ICMR, Chennai (2nd from left) speaking to the audience during question hours. Dr.Vijay Viswanathan, Managing Director, M.V.Hospital for Diabetes (3rd from left), Dr.M.Balasubrmanian, Former NWG member , IMA RNTCP (4th from left), Dr. Ram Manohar Rao, Technical Consultant, IMA-GFATM and Dr. A.J.Hemamalini, Head of the Nutrition Department, Sri Ramachandra University (6th from left) and Dr. Neeraj Bedi, Medical Superintendent, M.V.Hospital for Diabetes (extreme left) are seen on the dais. Below is the gathering for the panel discussion, which consists of health officers of various government hospitals in Chennai and other districts. Chennai On 3rd AUGUST, 2012. VELLORE INSTITUTE OF TECHNOLOGY AND M.V.HOSPITAL FOR DIABETES ROYAPURAM CHENNAI SIGNED A MEMORANDUM OF UNDERSTANDING ON 3RD AUGUST, 2012. Vellore Institute of Technology Chancellor Dr.G.Viswanathan and M.V.Hospital for Diabetes Royapuram, Chennai Managing Director Dr.Vijay Viswanathan exchanging the MoU documents signed. VIT Vice-President Mr. Shankar Viswanathan, VIT Joint Vice Chancellor Mr.Narayanan, Prof. Ms.Radha Saraswathi, Dr.M.Parthiban, Vice-Dean, and Dr. K.Satyavani, Asst. Director of Research of Prof. M.Viswanathan Diabetes Research Centre Royapuram were also present. The two institutions will work together for promotion of biotechnological research in treatment of diabetes. They will also share their expertise, knowledge and resources in the respective fields. The VIT university will also enroll research scholars working at M.V.Hospital for Diabetes for Ph.D., according to MoU. Chennai On Thursday 2nd Of August, 2012. LAUNCH OF FREE DIABETES SCREENING FOR TUBERCULOSIS PATIENTS AND PRESS CONFERENCE TO ANNOUNCE THE RESULTS OF A DM-TB STUDY BY PROF. M. VISWANATHAN DIABETES RESEARCH CENTRE AT A FUNCTION HELD IN CHENNAI ON THURSDAY 2nd OF AUGUST, 2012. Dr. Vijay Viswanathan, Managing Director, M.V.Hospital for Diabetes (Left) & Dr.Neeraj Bedi, Medical Superintendent of the Institute (Right) at the launch of Free Diabetes Screening for Tuberculosis Patients. They are flanked by research team of Prof.M.Viswanathan Diabetes Research Centre, Royapuram. Dr.Vijay Viswanathan, Managing Director and Dr.Neeraj Bedi, Medical Superintendent addressing the media at the launch of free diabetes screening for Tuberculosis patients and announcing the results of a DM-TB study are seen answering their questions. Photo below is the view of the selected media for the press conference. Chennai – Saturday, 16th of June, 2012. HONOURING DIABETICS HEALTHY AT 80+ AND LAUNCH OF SENIOR CITIZEN 80+ HEALTH PRIVILEGE CARD BY M.V.CENTRE FOR DIABETES MYLAPORE & PERUNGUDI HELD AT SOUTHERN CROWN HALL, GRT GRAND, T NAGAR, CHENNAI ON SATURDAY, 16TH OF JUNE, 2012. Mr.V.P.Ramaswamy, a 99 year old diabetic patient being honoured by Dr.V.Shanta, Chairman, Cancer Institute, Adyar. Dr.Vijay Viswanathan, Managing Director (Centre) and Dr.Neeraj Bedi, Medical Superintendent (Extreme Right) are also seen in the picture. Photo (Right) Senior Citizen 80+ Health Privilege Card being launched by Dr.V.Shanta. Meet the Medical Experts Session is in progress. (Experts from Left) Dr. Dharini Krishnan, Dietitian, Dr.G.Khalid, Dental Surgeon, Dr.(Mrs) Muthu Jayaraman, Nephrologist, Dr.G.Sengottuvelu, Senior Cardiologist, Dr.Vijay Viswanathan, Chief Diabetologist, Dr.John Benno, Ophthalmologist, Dr.H.Burman, Consultant Diabetologist are seen in the picture. Audience photos are also seen below. Chennai – Wednesday, 28th of March, 2012. NEW PREMISE OF M.V.CENTRE FOR DIABETES WAS INAUGURATED BY Mr. A ABOOBUCKER, VICE CHAIRMAN, HAJ COMMITTEE OF INDIA, MINISTRY OF EXTERNAL AFFAIRS ON WEDNESDAY 28TH OF MARCH, 2012 AT 11 a.m. AT NO.9, DR. RADHAKRISHNAN SALAI (NEAR CITI CENTRE SIGNAL) MYLAPORE 600004. Mr. A. Aboobucker inaugurating the new premise of M.V.Centre for Diabetes, No.9, Dr.Radhakrishnan Salai. Dr. Vijay Viswanathan , Managing Director (Right) and Dr. J.Nagarathanam, Chief Executive (Left) are also seen. Photo (Right) Mr.Aboobucker is lighting the traditional lamp as part of the inauguration ceremony. Chennai – Saturday, 17th of March, 2012. DRC Gold Medal Oration Award – 2011 & the first Prof. M. Viswanathan National Award for Excellence in Medical Teaching & Medical Care were held at Russian Cultural Centre, Chennai on Saturday, 17th of March, 2012. Mr. Mike Nithavrianakis, British Deputy High Commissioner, Chennai was the Chief Guest. He gave away DRC Gold Medal & Citation to Dr. Anoop Misra, Director, Centre of Internal Medicine, Fortis Hospital, Vasant Kunj, New Delhi and the first Prof. M. Viswanathan National Award for Excellence in Medical Teaching & Medical Care to Dr. Ramchandra Dattatraya Lele, Emeritus Professor, National Academy of Medical Sciences, India. A panel discussion on 'Social Determinants of Diabetes in India' was also held in which government dignitaries belonged to health departments both Central & State, NGOs, Media, Medical Practitioners, & Educational Institutions also took part. Dr. Gojka Roglic, Responsible Officer, Department of Chronic Diseases & Health Promotion, WHO Geneva was also present on the occasion. Mr. Mike Nithavrianakis, British Deputy High Commissioner, Chennai (2nd from right) presenting a bust and citation of Prof. M.Viswanathan National Award for Excellence in Medical Teaching & Medical Care to Dr. Ramchandra Dattatraya Lele, Emeritus Professor, National Academy of Medical Sciences, India (2nd from left). Dr. Vijay Viswanathan, Managing Director, M.V.Hospital for Diabetes, (2nd from left), Dr.S.N. Narasingan, Dean, Prof. M.Viswanathan Diabetes Research Centre (Extreme Right) & Dr. J.Nagarathnam, Chief Executive, M.V.Hospital for Diabetes (Extreme Left) are also seen. Dr. Gojka Roglic, Responsible Officer, Department of Chronic Diseases & Health Promotion, WHO Geneva delivering a lecture on 'Diabetes Pandemic : The Latest Figures from Across the World". Mr. Mike Nithavrianakis, British Deputy High Commissioner, Dr.Vijay Viswanathan, Managing Director, M.V.Hospital for Diabetes, Dr. Narasingan, Dean, Prof. M.Viswanathan Diabetes Research Centre are seen on the dais. Photo (Right) Dr. Anoop Misra, Director, Centre of Internal Medicine, Fortis Hospital, Vasant Kunj, New Delhi receiving the Citation from Mr. Mike Nithavrianakis. Dr.S.N. Narasingan (extreme right), Dr.Vijay Viswanathan (3rd from left) & Dr.Gojka Roglic, Responsible Officer, WHO (2 nd from left) are seen in the picture. (Photo Left) Mr. Mike Nithavrianakis, British Dy. High Commissioner presenting DRC Gold Medal to Dr.Anoop Misra, Director, Centre of Internal Medicine, Fortis Hospital, Vasant Kunj, New Delhi and (Photo Right) a panel discussion on 'Social Determinants of Diabetes in India' is in progress. A full view of the audience in the Russian Cultural Centre auditorium.